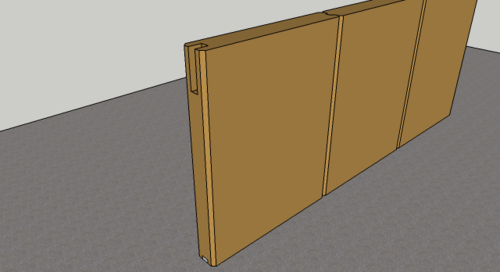 I’ve been putting off thinking about the solution to this problem for a little while, instead focussing on more immediate jobs but tonight I sat down again in front of Sketchup and resolved the construction detail of the door opening in the rammed earth wall. There are a few design constraints in play here - the walls must incorporate a control joint at no more than 3m intervals, and the section above the door must be supported by a galvanised 100x100x10 angle lintel. I’ve been thinking about how to build the walls and incorporate the lintel, and I’ve finally come up with the solution. 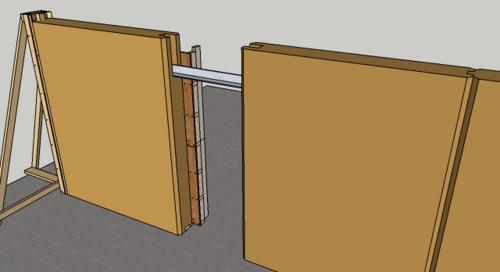 When I ram the panel to the right of the door opening, I’ll incorporate a 430x100x150 timber block at the top of the form, in order to leave a rebate in the wall. I’ll do the same for the panel on the other side of the door opening, and into the resulting rebates I’ll install the lintel. 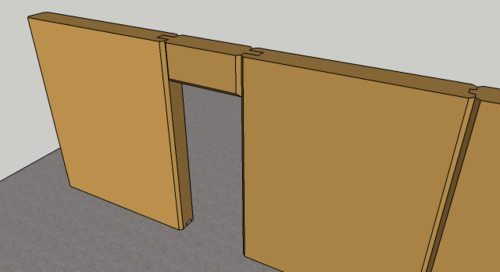 Then I can prop a form panel under the lintel, set up my forms above and ram the infill above the door.